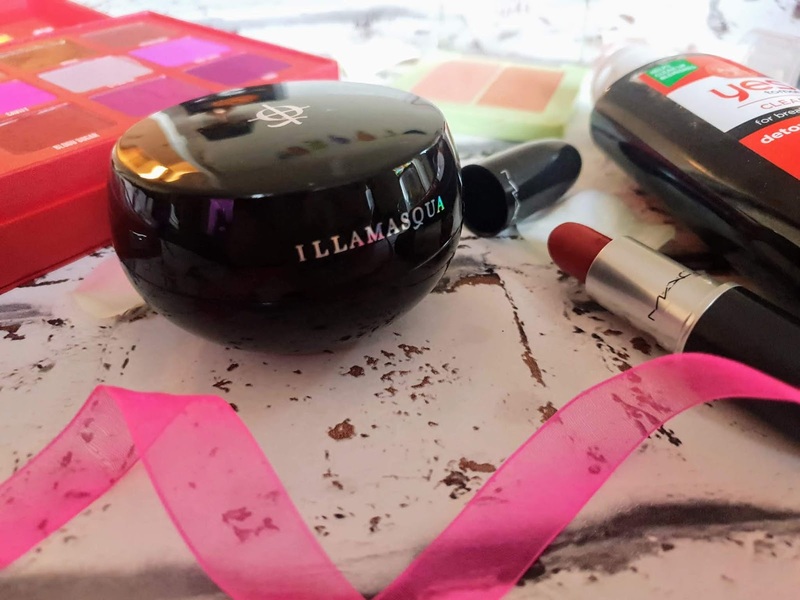 I have been a huge fan of Illamasqua ever since I discovered the brand when I first started blogging a few years ago. The main products I have in my collection is my Illamasqua lipsticks which I just treasure. I have tried a fair amount of their products including their eyeliner, blusher and also their foundation. One product I was wanted to out was their primer as I have heard many positive reviews on it but was a bit on the fence about actually purchasing it since it costs £34 with a volume of 104g. 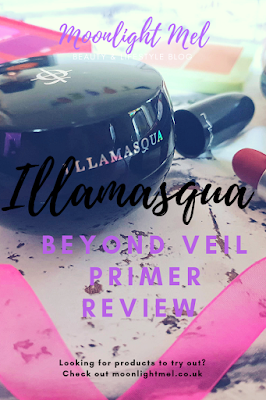 I actually found a lot of Illamasqua makeup in my local TK Maxx a few months back and not only did I find the amazing Shiver eyeshadow palette at a bargain price but I found the Illamasqua beyond veil primer for £10 compared to the retail price of £34!!! BARGAIN. 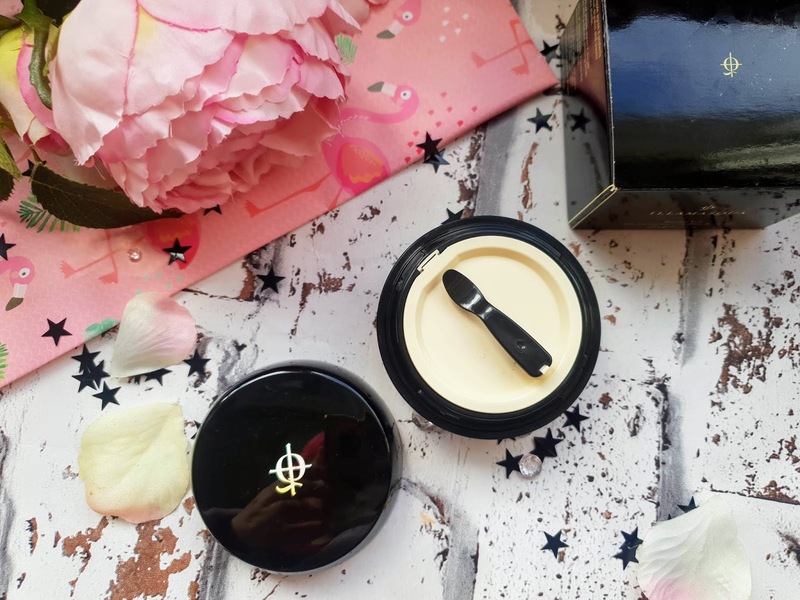 The primer comes nicely presented in the classic packaging of Illamasqua. On that box has the name of the product and also some info about it and also the ingredients. The primer comes in a nice jar and it does actually feel like a nice premium product. It kinda reminds me of a modern twist on retro skincare products packaging back in the Victorian era or something like that. The primer opens by turning it and inside you are greeted with a lid that has an instrument that kinda looks like a spoon/scoop which is for applying the right amount primer onto your skin. Underneath the lid, you have the actual primer which is a champagne colour and has a bit of sparkle to it if you look closely. The texture is very unique in my opinion as many primers I have tried in the past have been cream based but this is gel based and comes out in a sort of chunks that you can't get out perfectly but nonetheless, the scoop works well at getting the amount of product you need. Applying this to my freshly washed face is pretty simple really. I just get the scoop and get some of the beyond veil primer and apply generously to my face. It absorbs into the skin quite easily after a few moments, at first my face looked quite shiny until all absorbed completely then you can see some of the sparkles which have a lovely golden shimmer. The beyond veil primer is actually a partnership of Illamasquas iconic Hydra veil primer and the metallic illuminating beyond powder. It has a lightweight gel formula that instantly hydrates the skin to give a lovely glowing and illuminated finish. Beyond veil is formulated with multi-active ingredients including gardenia Florida fruit extract and sodium hyaluronate which help retain a youthful look. It also has haematococcus pulvais and vitamin C to help improve skins elasticity and brightness. Aqua (Water, Eau), Alcohol Denat., Butylene Glycol, Aluminum Starch Octenylsuccinate, Polyacrylamide, Phenoxyethanol,& Ethylhexylglycerin, Polysorbate 60, C13-14 Isoparaffin, Methylparaben, Carbomer, Sodium Hydroxide, Laureth-7, Parfum (Fragrance),&Nbsp;Sodium Hyaluronate, Glycerin, Sodium Citrate, Xanthan Gum, Titanium Dioxide (Ci 77891), Iron Oxides (Ci 77491, Ci 77492). Overall I am quite happy with my purchase and I am glad I found it in TK Maxx. Would I say its the best primer I have ever tried? Unfortunately not. I will use this primer up but I don't think I would go out my way to repurchase it at full price, maybe at the sale price but definitely not full price. It says its hydrating but for me, it wasn't really compared to other primers I have tried including high street brands. It has a lovely floral scent which is lovely and isn't overpowering at all. I do love the golden shimmer but once I put my foundation on you couldn't see the shimmer at all. Maybe if you used this product alone you would almost definitely see the shimmer. Applying foundation onto the primer is really simple since it creates a nice smooth base. It does help keep the foundation in place all day with a little bit of help with a setting powder and makeup setting spray such as the urban decay all nighter spray in which I love. Even though this isn't for me I default still want to try the other Illamasqua primers to try them out. Overall I rate it 8 out of 10. 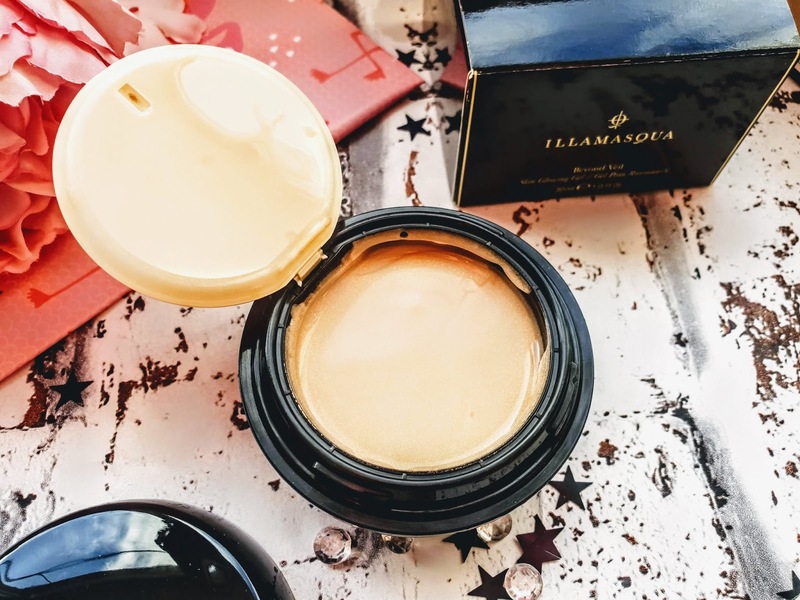 Have you tried any of the Illamasqua primers? If so which is your favourite? 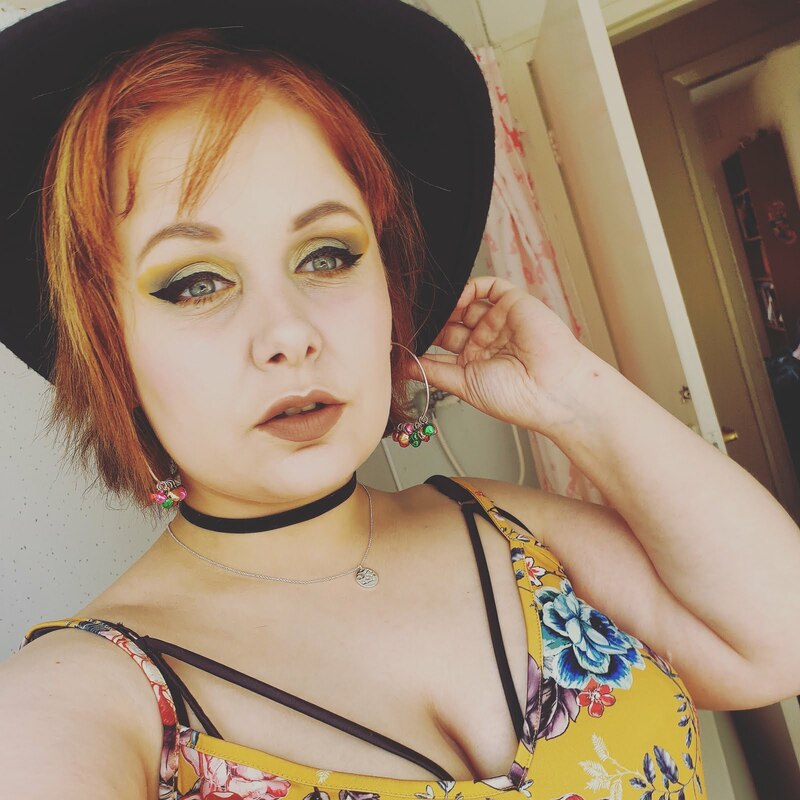 I really need to try more from Illamasqua! They have so many gorgeous products! I love a TKMaxx bargain! This is a really good find but it's a shame that you wouldn't repurchase at it's full price, at least you got to try it and didn't spend the full amount! You're so lucky to find things like this in your TK Maxx that aren't open or used its so annoying when I go into my local store they're always opened or stolen and just the boxes are there! It's a shame you didn't enjoy this primer as much as you'd hoped but at least you didn't have to pay full price to find out that you didn't get on with it! It's a shame this wasn't amazing but still sounds like it was a good buy even just to try, especially at a discounted price! I do love TK Maxx for finding high end products at discounted prices - I really need to try something from Illamasqua, I'm yet to ! 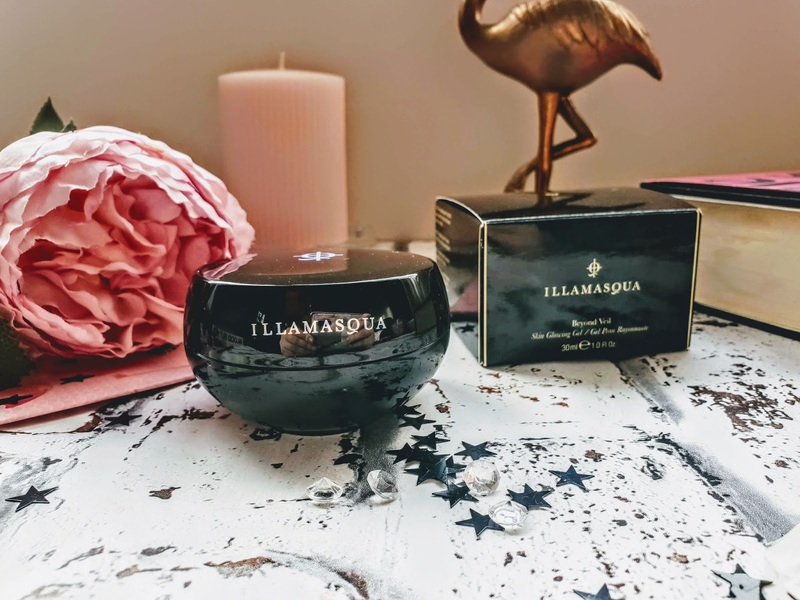 I have never tried anything from Illamasqua. It's a shame this didn't go as you had hoped but at least you didn't pay full price for it. TK Maxx can be amazing for finding high end products!